I make no secret of my love for the guys at Vlambeer. Their approach to design, making games that are instantly understandable yet endlessly challenging, hits at the very core of what I think makes for timeless entertainment. For this year's PAX Prime show, they brought along their latest project; the stark and simple, Luftrausers. 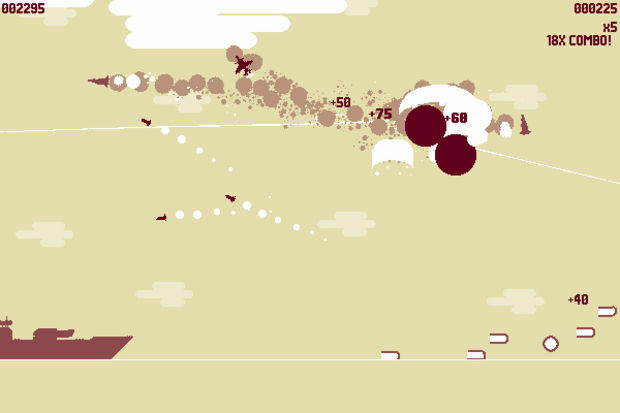 Luftrausers first saw life as the singular Luftrauser, a Flash game the Vlambeer guys put together over two days in mid-2011 with artist Paul Veer and musician Jukio "KOZILEK" Kallio. Basic but addictive, the player controls an acrobatic fighter jet against an endlessly increasing onslaught of enemies. The balance is struck by your ability to automatically repair your ship whenever you're not shooting, leading to desperate chases, quick maneuvers and a whole lot of dying. 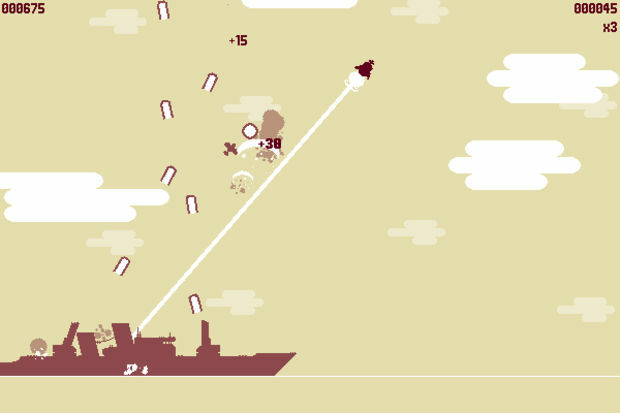 Luftrausers is all this and much, much more. The pluralization of the prior title for this new game is apt. Where the old game had but one model of plane for you to pilot, Luftrausers will feature lots of options to choose from through combinations of "cannon," "body," and, "engine" parts. Weapon options vary from burning lasers to spread cannons and explosive ordinance which fills the screen with a flower of hot death. Engines affect rate of acceleration, top speed and turning ability, while the body of a craft can determine its ability to withstand damage and repair itself. In the demo I played at PAX Prime, these elements were selected entirely at random, giving the player a different combination of abilities with every play. I don't remember exactly how many games I played (maybe a dozen) but I also don't remember running into any of the parts more than twice during that time. It would take a second to figure out how best to pilot each plane -- acceleration and turning are highly responsive, as a general rule, but how much and in what direction can be in question -- but it would only be a second before moving felt natural. Despite every ship configuration playing a little bit different (in some cases, like a body that takes little damage from collisions but crumples under fire, a lot different), that core mechanic of healing when not firing still holds the whole thing together. Even when the situation seems desperate, there almost always seems to be a way out if you can pilot skillfully or shoot accurately. The trick is in trying to figure out which way is best in measures of milliseconds. Every ship configuration also has its own soundtrack. Luftrausers' soundtrack, composed again by DJ KOZILEK, will be as modular in its design as the Luftrauser itself. The music is being composed in such a way that the individual components of the craft have specific music associated with them, meaning that different combinations will produce different background music while you're playing. The game would be utterly incomplete without the imposing, militaristic score and while I didn't specifically notice the differences from one plane to the next while I was playing, my attention was fairly fixated on little red planes and lots of explosions and it's always hard to focus on audio in a loud convention hall setting. Luftrausers is more visually complex than its predecessor as well, featuring as many as six (!) colors on-screen at the same time. Kidding aside, graphic elements like clouds and the water successfully evoke a sense of depth despite the game being very obviously two-dimensional in play. The flat silhouettes of your plane and enemy planes twist and dance and yet never cease being solid, flat colors. And, thankfully, the resolution is dramatically greater, lending a crispness to everything and allowing the stark contrast of the graphics to pop. Oh, and you know that evil thing developers do where your game ends and the only thing you have to do to start another one is press a button? 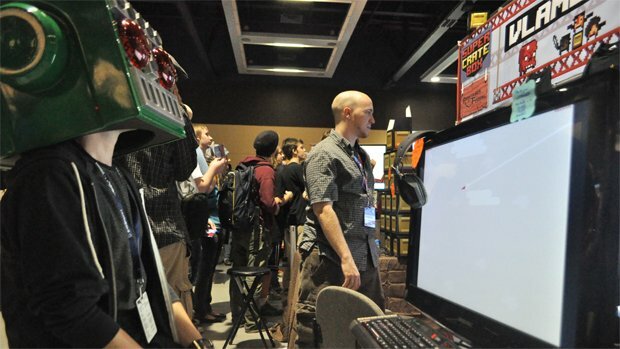 Yeah, that's here too, and I'd just like to apologize to the people who were standing behind me, waiting for their turn to play at PAX. Blame those canny Dutch bastards for making their game too easy to be absorbed by. Devolver Digital will be publishing Luftrausers, as they did with Vlambeer's contribution to the Serious Sam series, The Random Encounter. It's currently planned for release near the end of this year on PC and Mac, with a console release expected next year.